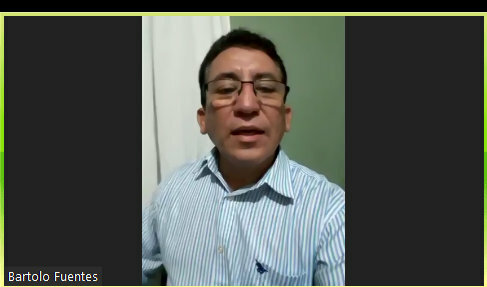 Honduran Congress member Bartolo Fuentes (2014-2017) spoke to a large audience through a webinar organized by the Honduras Solidarity Network titled Roots of the Exodus: From the Honduran Political Crisis to the Refugee Caravan, an Update. Fuentes, a member of the LIBRE political party, a party organized out of resistance to what are widely seen as stolen elections of 2013 and 2017, spoke from the capital Tegucigalpa. Fuentes had been deported from Guatemala while accompanying a caravan of Hondurans fleeing violence, political persecution, and extreme poverty. 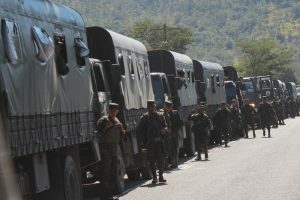 Although multiple groups of several hundred escape conditions in Honduras daily, Fuentes believes the particular massive group that left Honduras on October 13, did so as a result of unprecedented widespread media coverage. So what started as a group the usual size of 150 to 200 people fleeing Honduras, grew to 1500 people overnight, and grew at the same rate each day after that. At the height of its numbers, about 6000 people reached Mexico City in the first wave, 2000 in the second, and 1500 in the third wave. Fuentes said that about 10,000 people moved through Mexico and that most made it to Tijuana, while others stayed back in Mexico to ask for asylum there. With over 50% of the vote counted, the numbers of which were announced close to 2 AM the next morning, showed Salvador Alejandro Cesar Nesralla Salum ahead of incumbent Juan Orlando Hernandez Alvarado 45.17% to 40.21%. The election oversight body, the Supreme Electoral Tribunal (TSE) announced that the results were not statistically reversible and Hondurans could be heard across the capital, Tegucigalpa, celebrating in the streets. Other persecutions exist against the small farmer sector. Currently about 5000 campesinos are facing arbitrary charges for their work according to Fuentes. Some of those are jailed, others have to travel to other cities to “sign in” on a weekly basis, creating a financial hardship to those living on meager sustenance wages. Others are fighting arrest warrants for their work fighting for their land, or fighting mining concessions, or hydroelectric projects. Fuentes says the assassinations are continual. Nevertheless protests continue throughout the country. A highway takeover was violently repressed by police in the previous few days, while today three students were arrested for having burned buses. It was later discovered that police infiltrators carried out the arson in an attempt to criminalize student protesters. A protest earlier in the week ended with a journalist being shot. In fact I would say that’s one of the achievements of the caravan has been to make this issue visible and get the social movements to include this issue in their agenda.